Wrinkled sagging skin is probably the most visible sign of aging, but hidden within the body, blood vessel walls loose elasticity too, becoming more vulnerable to hypertension. The two processes are partly due to decreases of the same protein as people and animals age. A team of researchers at the Center for Self-Assembly and Complexity, within the Institute for Basic Science (IBS) have synthesized the first contrast agent to observe and measure elastin, the protein that gives strength to blood vessel walls, and flexibility to skin. Beyond cosmetics, the dye could be useful to better understand the role of elastin in biological processes and to verify the health of blood vessels and organs. The full study can be read in Chem. "Since elastin is located in the subcutaneous tissue, it is difficult to visualize with current methods. Moreover, it is a complex protein to work with as it has various forms, variable chemical linkages, and it is renownedly difficult to make a model for computational study. For the screening, we used intact elastin from throughout the whole body to avoid such problems," explains CHANG Young-Tae, corresponding author of the study. 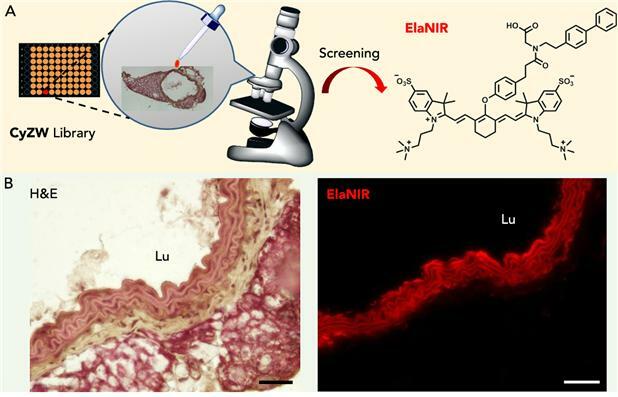 The research team developed the first near-infrared fluorescent contrast agent for elastin, called ElaNIR (Elastin Near-InfraRed), capable of detecting the elasticity of tissues in living animals. The method is based on near-infrared rays with wavelengths of 700-900 nanometers which can reach elastin because of their excellent skin permeability. Moreover, ElaNIR was selected from a collection of fluorescence molecules that emit near-infrared rays. Generally, fluorescent materials tend to stick to other substances, resulting in a blurred image area around the target. On the other hand, ElaNIR has an equal number of positive and negative charges within the same molecule, which has been shown to minimize non-specific binding to serum proteins, normal tissues, and organs, which provides cleaner images. ElaNIR not only emits fluorescence at the near-infrared range, but also allows to visualize elastin-containing structures via photoacoustic spectroscopy. In photoacoustic imaging, the absorbed light energy is converted into ultrasonic sound, which can penetrate skin better than fluorescence. As a result, photoacoustics can provide higher sensitivity and higher spatial resolution in ElaNIR compared to fluorescence imaging. Thanks to this technique, the scientists were able to acquire 3D tomographies by detecting ultrasonic waves generated by absorbed near-infrared light. IBS scientists demonstrated the selective binding of ElaNIR to elastin using the cross section of a rabbit's aorta. Then, they applied it to study mouse organs with high elastin content. ElaNIR was able to highlight elastin in lungs, skin, urinary bladder, kidney, aorta, and ears. Finally, ElaNIR was tested on living animals. When injected intravenously in old and young mice, the team was able to compare the amount of elastin in the skin. In the older rodents the amount of elastin was significantly reduced (1.8 times) compared to the younger ones. Using the photoacoustic technique, a high resolution 3D tomographic image was obtained which visually shows the distribution of elastin. Another promising feature of ElaNIR is its rapid removal from the system: more than 90% of the injected dose was cleared from the blood in four hours. "All current techniques estimate the age of the skin indirectly, for example via skin moisture. This is the first probe to directly measure skin elastin in living organisms, both painlessly and without biopsy," concludes Chang. ElaNIR will be provided free of charge to researchers seeking opportunities for collaboration or application.